This statistic shows the aggregated gross revenues of PricewaterhouseCoopers from 2006 to 2018. In the fiscal year of 2018, PwC generated approximately 41.3 billion U.S. dollars in aggregated gross revenues. PwC is one of the four largest accounting and audit firms in the world. These firms, known collectively as the ‘Big Four’, also include Deloitte, Ernst & Young (EY) and KPMG. PwC is the second largest of the Big Four in terms of revenue in 2018, coming close after Deloitte. PwC has three main service lines – assurance, advisory and tax. In terms of worldwide revenue, assurance is PwC’s largest service line and accounted for over 41 percent of the company’s total revenue in 2018. PwC also had one of the highest assurance revenues of the Big Four firms in 2018. 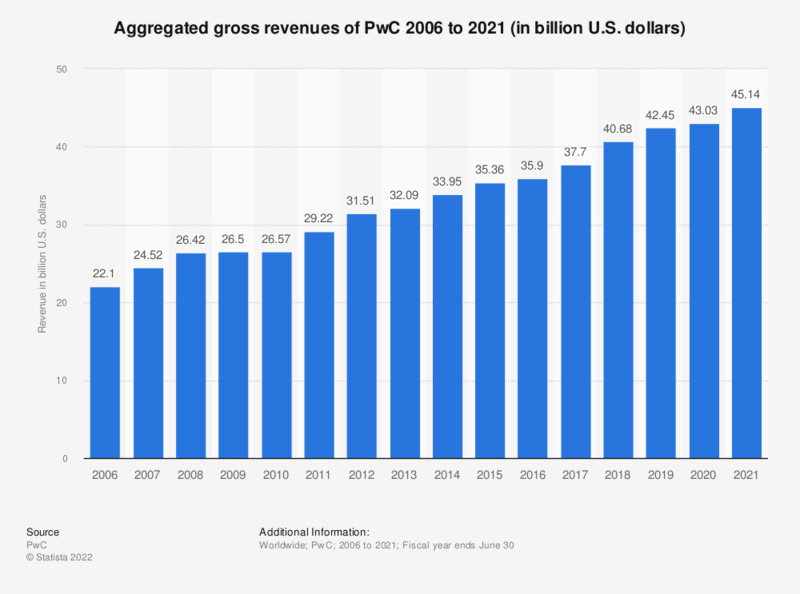 PwC’s tax service business line is also the largest of the Big Four, grossing 10.45 billion U.S. dollars in 2018. In comparison, KPMG made 6.34 billion U.S. dollars from tax services in the same year. The majority of PwC’s revenue is generated in Western Europe and the Americas. In 2018, these two regions made combined revenues of around 31.3 billion U.S. dollars, with the rest of the world grossing just under 10 billion U.S. dollars. Of these two regions, the Americas is the largest. PwC generated 17.5 billion U.S. dollars in there in 2018, which accounted for over one third of the revenue in that year.